On Diwali 2013 Rakesh Jhunjhunwala was interviewed by bolloywood actress Chitrangada Singh & Kripa Raman of Mumbai mirror. In his talk Rakesh Jhunjhunwala disclosed his views on current slowdown. He also spoke on some interesting fact about his personal life. 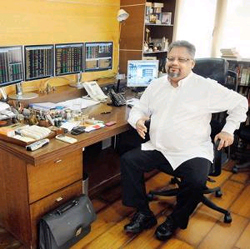 What’s a day in the life of Rakesh Jhunjhunwala like? I wake up any time between 7 and 10 am. I watch the markets till around 10.30 am. Then I have my bath, eat a small breakfast, and by noon I am in office. Till 3.30-4 pm I watch the markets again after which I meet people, attend to reports and do whatever reading that has to be done. By 7.30, I am out of the office. Once or may be twice a week, I socialize. Are your investments driven by intensive research or great instinct? They are driven by everything. It is difficult to say the one thing that triggers my interest (in a particular stock). But finally, it is intuition. A lot of people collect data for me but in the end I do my own analysis. When you think of your best and worst investments, what were the things that went into them? I have not been a good investor because I am Rakesh Jhunjhunwala, I have been a good investor because God ordains that I become one. There is a silent hand that is always helping me. Besides shares, real estate and cars, what are your indulgences? I buy some racing horses. There’s no return in it. I like very fine whiskies, and occasionally very expensive cigars. Do people flock to you for investment advice wherever you go? Not these days. They come to me when the market is bullish and stocks are up…I don’t get irritated, I give them tips…But one cannot make money from borrowed knowledge. Do you do any charity? Is there a particular cause that moves you? My pet project in life, about which I am doing nothing at the moment, is malnutrition. I also hope to give 25 per cent of my wealth on July 5, 2020, when I will be 60 years old. That would be roughly about Rs 5,000 crore by that particular day. At present, I give away Rs 15 to 20 crore in charity annually. Well I’ve just bought property. I like sea-facing homes. I could never think of leaving Bombay. I can’t see myself living anywhere else. I have been here since I was three years old. Which sector would be safe for Investment? Export sector is doing very well and it is expected to grow even Finance sector is good for investment. It is time to invest in the market. You will get very good gains over the next three to five years. What about Gold is it good investment bet this Diwali? I do not invest in gold but I can say that over the next year gold could be good investment but over four to five year horizon, I am not so bullish on gold. There is a slowdown, a recession. There is no doubt about it. There is a slowdown in the country but it is temporary, it will reverse itself. Markets are like women, always commanding, mysterious, volatile exciting and it is not a joke. Just as you cannot have a good relationship with a woman by brow-beating her, you cannot have a good relationship with the market by trying to bully it. The king is the market. Just as women have emotions, markets have emotions. It is basically a product of the thoughts and emotions of so many individuals.